Proud/Father creates a tense, murky unsettling of ambient din on the A side of their newest album, “Symbolic Exchange & Emptiness” on PA’s ORB TAPES. The side begins with a slow, gentle pulsing ambient tone which slowly evolves over time into washed out, thick waves of sonic fog. “The first side is a reflection of isolation, both physical and emotional, from depression and similar mental health disorders. ” quotes the releases bandcamp page, and the subtle, harmonic shifts seem to oscillate moods ever so slightly without ever jarring the listener out of a meditative, hypnotic state. Several layers of drone eventually give birth to lush, washed out, undulating vocal tones, or are they even? Proud/Father seamlessly blends multiple sources into a singular harmonious, but still unsettling buzzing, like the buzzing inside your body when anxiously awaiting a phone call where every second seems like an eternity and every far away sound oscillates as a precursor to something your unsure about and you can’t place your brain on why. P/F has mastered keeping us in a sonic stasis, whilst their shifting tones dance around an aura of confusion, with even a dab of resolve. The B side “Al alejarme de casa recuerdos débiles se apagan” , according to the bandcamp page ” is an exploration of the fading Boricua culture and the history of Puerto Rican independence movements.”, and it begins with a choppy tense transmission, the sound of a message in a bottle being dragged through an underground cement tunnel ever so swiftly and softly as to not detect the unknowing above. The choppy radio static like noise transmissions quickly fold into more undulating, thick walls of ambient drone, a thick fog casts itself inside the ear and modulates our mere understanding of the sound’s orgin, we are left with an increasingly angrier and more aggressively articulated drone of unknown origin. What was once a singing drone has turned into an angry, whipping, radicalized wind, devoid of mission and geographical direction, just a thickness of tension and intention. Proud/Father continuously oscillates between drone, ambient, and soundscapes with swiftness, however compositionally things never seem rushed, always blending into each other with care and precision, P/F has crafted an ambient soundscape strategy to call all their own. For fans of The Shadow Ring, Tim Hecker, Beast Nest etc. Tapes are apparently sold out, though you can get the digital here, highly recommended. Taking a stroll outside of our normal “experimental” zone a bit to share a premiere from Citrus City Records artist Peaer ahead of a reissue due for release March 18th of this year. Citrus City hosts a diverse myraid of artists and has been popping up in all corners of the internet for some time, and taking a look at their eclectig bandcamp page linked below offers a diverse sonic array. Here we have Peaer’s track “left/felt pt 2.” , which opens with a slow twanged guitar pluck with a minimalist beat and softly spoken words, however things don’t remain the same for too long as things begin to open up and expand and voice articulates fuller and louder presentations each phrase. The track slowly and steadily becomes a much heavier, fuller, yet dissonant form of itself blending thick drums, as the break drops we’re thrusted into a full on post rock composition, strummed waves of chord distortions, decaying riffs and arching waves of tone poem high register guitar work, dynamic and interesting throughout. Take a listen below and preorder the cassette today! Peaer states, “‘the eyes sink into the skull’ was a phrase I lifted from a random webpage when I was reading about the stages of decomposition of a human body. The image conjured, although gruesome, captured the introspective nature of the album. This version has been slightly remixed and completely remastered by our beloved Jeremy Kinney. “the hands and feet turn blue” is another line from that same writing found here. This recording includes a re-recorded version of the song “left/felt” that includes a brand new portion of music, one that was written virtually one year after the original song was written and recorded. Released for the first time here. Also on the collection are two live tracks, from our first official tour as a band in 2016. The two remixes are included as well, a remix of the song “mouther” made by our friend Andrew Schuyler (aka morningstar), and a remix of the song “the dark spot” made by good friend Jacob Sachs-Mishalanie, both originally made in 2015 and have been patiently awaiting release. Finally on the new recordings are two previously unreleased demos that I have made since. Those two songs “happy birthday to me” and “the entire day feels like morning” were recorded on Ableton before being fed into a handheld tape recorder to characterize and color the recording. Peaer reissues their debut album, the eyes sink into the skull, now remastered & reissued on tape for the first time alongside special remix & live sessions album, the hands and feet turn blue, via Virginia/Brooklyn based label Citrus City Records. Available digitally and physically March 18, 2019. This split begins with Andrew Weathers on the A side offering three experimental guitar and synth offerings, beginning with the track “Llano” which offers spacious, minimalist guitar work complemented through warm buzzing, swelling synthesizers. The synths and guitars play wonderfully off each other in a barren, pulsing, slightly unsettling tone poem. The second track, and standout of the tape “Mugwort Moon” is a huge, throbbing synth number with insect-like rattling pulses that transport the listener into a parallel universe of floating drones. Weathers synthesizes a perfect union of tone and spaces to create lush, dream-like compositions with heavy and dissonant overtones. The Blaine Todd Side of the split is more a take on traditional Americana psychedelia rendered through reverb drenched folk thrusts. Todd skates across a lush and morose pond, blending dripping, cavernous guitar strums, backed with distant unsettled, sad vocals creating a fever dream style of psychedelic alt-pop. Gentle plucks and minimalistic events within the body of the guitar bloom into lush waves of intonation, a perfect compliment to the slightly more abstracted works of Andrew Weathers on the A side. Todd’s music is slightly more on the morose side of things where the Weathers side feels both dissonant and uplifting at the same time, a truly unique and dynamic pairing. “A striking document of wide open loneliness, this split release by Andrew Weathers & Blaine Todd contains timeless works about Wobblies, the Staked Plain, etc. 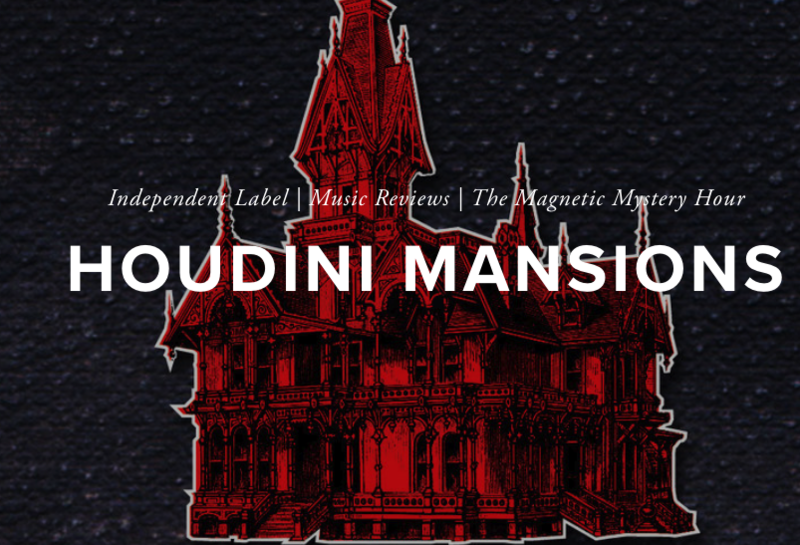 All in all, great release from Houdini Mansions, a hybrid label, review site and radio show/ podcast. Follow them today and keep a lookout for more from this exciting collective, as well as both artists individually.